Predictive prophecy stands as one of the most viable proofs of the Bible’s divine inspiration. Ezekiel’s prophecy concerning the city of Tyre provides an excellent example of such evidence. Ezekiel’s prophetic message is one of the easiest to place in an accurate time frame. In verse 2 of the first chapter, the prophet noted that his visions and prophecies began “in the fifth year of King Johoiachin’s captivity.” The date for this captivity is virtually unanimously accepted as 597 B.C. during the second deportation of citizens from Judea to Babylon, which is documented in detail in 2 Kings 24:10-20. Furthermore, not only is the deportation recorded in the biblical account, but the ancient Chaldean records document it as well (Free and Vos, 1992, p. 194). Since Ezekiel’s visions began five years after the deportation, then a firm date of 592 B.C. can be established for the beginning of his prophecy. The prophet supplies other specific dates such as the seventh year (20:1), the ninth year (24:1), the eleventh year (26:1), and the latest date given as the twenty-seventh year (29:17) [Note: for an outline see Archer, 1974, pp. 368-369]. Due to the firmly established dating system that Ezekiel chose to use for his prophecy, the date of the prophecy regarding the city of Tyre, found in chapter 26, can be accurately established as the eleventh year after 597, which would be 586 B.C. According to history, the Phoenician city of Tyre, located on the eastern shore of the Mediterranean Sea, stood as one of the most ancient and prosperous cities in history. Herodotus, known as the father of modern history, lived and wrote between about 490 B.C. and 425 B.C. (Herodotus, 1972, p. i). During a visit to the temple of Heracles in Tyre, Herodotus inquired about the age of the temple, to which the inhabits replied that the temple was as old as “Tyre itself, and that Tyre had already stood for two thousand three hundred years” (Herodotus, 2:44). From Herodotus, then, it can be supposed that the city goes back to 2,700 B.C. 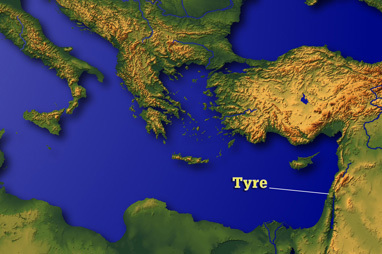 Due to its advantageous geographical position and good ports, Tyre became one of the wealthiest trading cities in history. Fleming noted that it “was the most important of all Phoenician cities” (1966, p. ix). During the reigns of King David and King Solomon (circa 1000 B.C. ), Hiram, king of Tyre, played a major role in the acquisition of building materials for important structures such as the Israelite kings’ houses and the first temple. In numerous biblical passages, the text states that Hiram sent cedar trees, carpenters, masons, and builders to Israel (2 Samuel 5:11) because of the Tyrians’ renowned skill in timber cutting (1 Kings 5:1-18). In addition, the Tyrians were equally well known for their remarkable ability to navigate the seas during Solomon’s era. Second Chronicles documents that Hiram sent ships and “servants who knew the sea” to work with Solomon’s men in acquiring gold from foreign lands (2 Chronicles 8:18). The city of Tyre had a rather interesting and beneficial geographical arrangement. About half a mile off the eastern shore of the Mediterranean Sea stood a small rocky island on which the original city of Tyre was most likely founded. Some time after the founding of this island city, the mainland city of Tyre was founded, which was called Old Tyre by the Greeks (Fleming, p. 4). Josephus cites a Phoenician historian named Dius, as reporting that the Phoenician king Hiram, who was closely connected to kings David and Solomon, built a causeway from the original island to a smaller island, connecting the two (Against Apion, 1.17). In addition to its beneficial geographic position, the city had great confidence in its many excellent defensive advantages. Fleming noted: “As early as 1400 B.C. Tyre was not only a great city but was considered impregnable” (p. 8). The ancient historian Quintus Curtius Rufus (most likely writing in approximately A.D. 50), listed several of these defensive traits that had remained intact as late as the siege by Alexander in 332 B.C. The force of the water and the wind that prevailed on the side of the city closest to the land was said to have produced a “corrosive force of waves” that would hinder the construction of any type of bridge or causeway from the mainland (4.2.8). Furthermore, the water nearest to the walls of the city was “especially deep” and would force any would-be attackers to position any type of siege mechanisms in the unstable foundation of a ship, and the wall “dropped sheer into the sea,” which prevented the use of ladders or approach by foot (4.2.9). During the time of Ezekiel, Tyre was well established and renowned for its building, manufacturing, and trade. Ezekiel said of Tyre: “Your builders have perfected your beauty” (27:4), and then he proceeded to list several different kinds of wood and imported materials used by the Tyrians (27:3-11). The prophet stated: “When your wares went out by sea, you satisfied many people; you enriched the kings of the earth with your many luxury goods and your merchandise” (27:33). But Tyre’s profitable trading had done little positive for its spiritual condition. In fact, as is often the case, the riches accrued by the city had caused widespread dereliction and spiritual decay. Concerning the city, Ezekiel noted: “By the abundance of your trading you became filled with violence within, and you sinned.... Your heart was lifted up because of your beauty; you corrupted your wisdom for the sake of splendor.... You defiled your sanctuaries by the multitude of your iniquities” (28:16-18). Among the sins listed by Ezekiel, one specific attitude maintained by Tyre was designated by the prophet as the ultimate reason for the city’s demise. Ezekiel noted: “[B]ecause Tyre has said against Jerusalem, ‘Aha! She is broken who was the gateway of the peoples; now she is turned over to me; I shall be filled; she is laid waste.’ Therefore thus says the Lord God: ‘Behold, I am against you, O Tyre’” (26:2-3). Apparently, in an attitude of commercial jealousy and greed, the city of Tyre exulted in Jerusalem’s misfortunes and expected to turn them into its own profit. Among Tyre’s list of despicable activities, the city’s slave trade ranked as one of the most profitable. The prophet Joel noted that Tyre had taken the people from Judah and Jerusalem and sold them to the Greeks so that the Tyrians could “remove them far from their borders” (Joel 3:6). These dastardly dealings with the inhabitants of Judah would not go unpunished. For thus says the Lord God: “When I make you a desolate city, like cities that are not inhabited, when I bring the deep upon you, and great waters cover you, then I will bring you down with those who descend into the Pit, to the people of old, and I will make you dwell in the lowest part of the earth, in places desolate from antiquity, with those who go down to the Pit, so that you may never be inhabited; and I shall establish glory in the land of the living. I will make you a terror, and you shall be no more; though you are sought for, you will never be found again,” says the Lord God (26:1-14,19-21). Several aspects of this prophecy deserve attention and close scrutiny. The prophet predicted: (1) many nations would come against Tyre; (2) the inhabitants of the villages and fields of Tyre would be slain; (3) Nebuchadnezzar would build a siege mound against the city; (4) the city would be broken down and the stones, timber, and soil would be thrown in “the midst of the water;” (5) the city would become a “place for spreading nets;” and (6) the city would never be rebuilt. In chronological order, the siege of Nebuchadnezzar took place within a few months of Ezekiel’s prophecy. Josephus, quoting “the records of the Phoenicians,” says that Nebuchadnezzar “besieged Tyre for thirteen years in the days of Ithobal, their king” (Against Apion, 1.21). The length of the siege was due, in part, to the unusual arrangement of the mainland city and the island city. While the mainland city would have been susceptible to ordinary siege tactics, the island city would have been easily defended against orthodox siege methods (Fleming, p. 45). The historical record suggests that Nebuchadnezzar destroyed the mainland city, but the siege of the island “probably ended with the nominal submission of the city” in which Tyre surrendered “without receiving the hostile army within her walls” (p. 45). The city of Tyre was besieged by Nebuchadnezzar, who did major damage to the mainland as Ezekiel predicted, but the island city remained primarily unaffected. It is at this point in the discussion that certain skeptics view Ezekiel’s prophecy as a failed prediction. Farrell Till stated: “Nebuchadnezzar did capture the mainland suburb of Tyre, but he never succeeded in taking the island part, which was the seat of Tyrian grandeur. That being so, it could hardly be said that Nebuchadnezzar wreaked the total havoc on Tyre that Ezekiel vituperatively predicted in the passages cited” (n.d.). Till and others suggest that the prophecies about Tyre’s utter destruction refer to the work of Nebuchadnezzar. After a closer look at the text, however, such an interpretation is misguided. Ezekiel began his prophecy by stating that “many nations” would come against Tyre (26:3). Then he proceeded to name Nebuchadnezzar, and stated that “he” would build a siege mound, “he” would slay with the sword, and “he” would do numerous other things (26:7-11). However, in 26:12, the pronoun shifts from the singular “he” to the plural “they.” It is in verse 12 and following that Ezekiel predicts that “they” will lay the stones and building material of Tyre in the “midst of the waters.” The shift in pronouns is of vast significance, since it shifts the subject of the action from Nebuchadnezzar (he) back to the many nations (they). Till and others fail to see this shift and mistakenly apply the utter destruction of Tyre to the efforts of Nebuchadnezzar. Furthermore, Ezekiel was well aware of Nebuchadnezzar’s failure to destroy the city. Sixteen years after his initial prediction, in the 27th year of Johoiachin’s captivity (circa 570 B.C. ), he wrote: “Son of man, Nebuchadnezzar king of Babylon caused his army to labor strenuously against Tyre; every head was made bald, and every shoulder rubbed raw; yet neither he nor his army received wages from Tyre, for the labor which they expended on it” (29:18). Therefore, in regard to the prophecy of Tyre as it relates to Nebuchadnezzar’s activity, at least two of the elements were fulfilled (i.e., the siege mound and the slaying of the inhabitants in the field). Regarding the prediction that “many nations” would come against Tyre, the historical records surrounding the illustrious city report such turmoil and war that Ezekiel’s prophecy looks like a mild understatement of the facts. After Nebuchadnezzar’s attack of the city “a period of great depression” plagued the city which was assimilated into the Persian Empire around 538 B.C. (Fleming, p. 47). In 392 B.C., “Tyre was involved in the war which arose between the Persians and Evagorus of Cyprus” in which the king of Egypt “took Tyre by assault” (p. 52). Sixty years later, in 332, Alexander the Great besieged Tyre and crushed it (see below for further elaboration). Soon after this defeat, Ptolemy of Egypt conquered and subjugated Tyre until about 315 B.C. when Atigonus of Syria besieged Tyre for 15 months and captured it (Fleming, p. 65). In fact, Tyre was contested by so many foreign forces that Fleming wrote: “It seemed ever the fate of the Phoenician cities to be between an upper and a nether millstone” (p. 66). Babylon, Syria, Egypt, Rome, Greece, Armenia, and Persia are but a sampling of the “many nations” that had a part in the ultimate destruction of Tyre. Thus, Ezekiel’s prophecy about “many nations” remains as a historical reality that cannot be successfully gainsaid. The historical account of Alexander the Great’s dealings with Tyre adds another important piece to Ezekiel’s prophecy. By 333 B.C., Ezekiel’s prophecy that Tyre would be destroyed and its building material cast into the midst of the waters had yet to materialize. But that situation was soon to be altered. Ancient historian Diodorus Siculus, who lived from approximately 80-20 B.C., wrote extensively of the young Greek conqueror’s dealing with Tyre. It is from his original work that much of the following information on Tyre’s destruction derives (see Siculus, 1963, 17.40-46). In his dealings with Tyre, Alexander asserted that he wished to make a personal sacrifice in the temple of Heracles on the island city of Tyre. Apparently, because the Tyrians considered their island refuge virtually impregnable, with war machines covering the walls, and rapidly moving water acting as an effective barrier from land attack, they refused his request. Upon receiving their refusal, Alexander immediately set to work on a plan to besiege and conquer the city. He set upon the task of building a land bridge or cause way (Siculus calls it a “mole”) from the mainland city of Tyre to the island city. Siculus stated: “Immediately he demolished what was called Old Tyre and set many tens of thousands of men to work carrying stones to construct a mole” (17.40). Curtius Rufus noted: “Large quantities of rock were available, furnished by old Tyre” (4.2.18). This unprecedented action took the Tyrians by complete surprise. Fleming noted: “In former times the city had shown herself well nigh impregnable. That Alexander’s method of attack was not anticipated is not strange, for there was no precedent for it in the annals of warfare” (p. 56). And yet, even though this action was unprecedented militarily, it was exactly what one might expect from the description of the destruction of Tyre given by Ezekiel hundreds of years prior to Alexander’s actions. The mainland city was demolished and all her stones, timber, and soil were thrown into the midst of the sea. 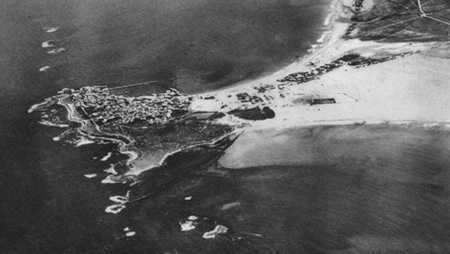 This aerial view of Tyre vividly shows the landbridge that Alexander created. Much silt and sand has accumulated over the years to widen the area of the original causeway. 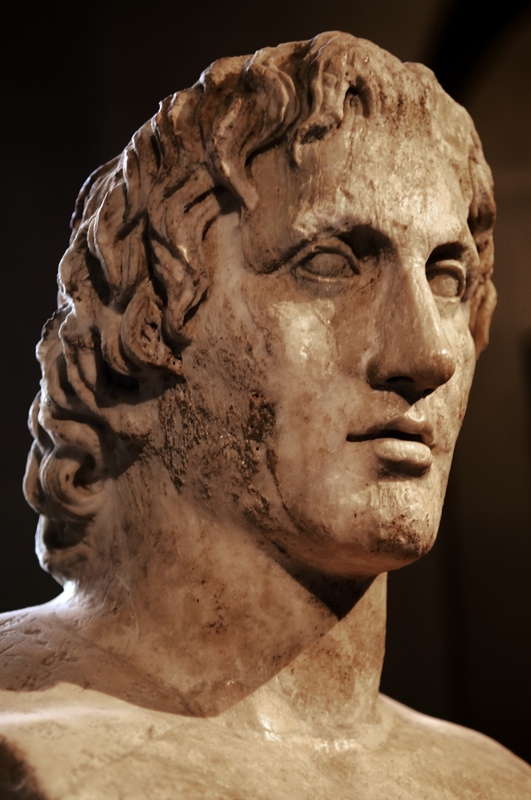 In spite of the fact that the Tyrians were taken by surprise, they were not disheartened, because they did not believe that Alexander’s efforts would prevail. They continued to maintain supremacy on the sea, and harassed his workers from all sides from boats that were equipped with catapults, slingers, and archers. These tactics were effective in killing many of Alexander’s men. But Alexander was not to be outdone. He gathered his own fleet of ships from nearby cities and was successful in neutralizing the Tyrian vessels’ effectiveness. With the arrival of Alexander’s sea fleet, the work on the land bridge moved much more rapidly. Yet, when the construction of the bridge was nearing completion, a storm damaged a large section of the mole. Refusing to quit, Alexander rebuilt the damaged structure and continued to move forward. In desperation, the Tyrians sent underwater divers to impede construction by attaching hooks to the rocks and trees of the causeway, causing much damage (Rufus, 4.3.10). Yet, these efforts by the Tyrians could not stop Alexander’s army and eventually the bridge spanned the distance from the mainland city to the island. Huge siege machines bombarded the walls of Tyre. Siculus’ description of the fight is one of the most vivid accounts of a battle in ancient history (17.43-46). Eventually the Tyrians were defeated, their walls penetrated, and Alexander’s forces entered the city and devastated it. Most of the men of Tyre were killed in continued fighting. Siculus recorded that approximately 2,000 of the men in Tyre who were of military age were crucified, and about 13,000 “non-combatants” were sold into slavery (17.46) [Others estimate the number even higher.] In describing the devastation of the city by Alexander, Fleming wrote: “There was general slaughter in the streets and square. The Macedonians were enraged by the stubborn resistance of the city and especially by the recent murder of some of their countrymen; they therefore showed no mercy. A large part of the city was burned” (p. 63). The secular, historical record detailing Alexander’s destruction of Tyre coincides precisely with Ezekiel’s prophecy concerning what would happen to its building materials. As Ezekiel had predicted, the stones, timber, and soil of the mainland city were thrown into the midst of the sea in an unprecedented military maneuver. For Ezekiel to have accurately “guessed” this situation would be to stretch the law of probability beyond the limits of absurdity. His acutely accurate representation of the facts remain as outstanding and amazing proof of the divine inspiration behind his message. One of the most disputed aspects concerning Ezekiel’s prophecy is the statement that the city of Tyre would “never be rebuilt” (26:14), and “be no more forever” (28:19). The skeptic points to modern day Tyre and suggests that these statements have failed to materialize. Till stated: “In fact, Tyre still exists today, as anyone able to read a map can verify. This obvious failure of a highly touted Old Testament prophet is just one more nail in the coffin of the Bible inerrancy doctrine” (n.d.). Several possible solutions dissolve this alleged problem. First, it could be the case that the bulk of Ezekiel’s prophecy dealt with the mainland city of Tyre, the location of which has most likely been lost permanently and is buried under the waters of the Mediterranean Sea. This solution has merit for several reasons. In approximately A.D. 1170, a Jewish traveler named Benjamin of Tudela published a diary of his travels. “Benjamin began his journey from Saragossa, around the year 1160 and over the course of thirteen years visited over 300 cities in a wide range of places including Greece, Syria, Palestine, Mesopotamia and Persia” (Benjamin of Tudela, n.d.). In his memoirs, a section is included concerning the city of Tyre. From Sidon it is half a day’s journey to Sarepta (Sarfend), which belongs to Sidon. Thence it is a half-day to New Tyre (Sur), which is a very fine city, with a harbour in its midst.... There is no harbour like this in the whole world. Tyre is a beautiful city.... In the vicinity is found sugar of a high class, for men plant it here, and people come from all lands to buy it. A man can ascend the walls of New Tyre and see ancient Tyre, which the sea has now covered, lying at a stone’s throw from the new city. And should one care to go forth by boat, one can see the castles, market-places, streets, and palaces in the bed of the sea (1907, emp. added.). From this twelfth-century A.D. text, then, we learn that by that period of time the city known as ancient Tyre lay completely buried beneath the sea and a new city, most likely on some part of the island, had been erected. George Davis, in his book Fulfilled Prophecies that Prove the Bible, included a picture of Syrian fishermen under which the following caption appeared: “Syrian fishermen hauling in their nets on the probable site of ancient Tyre, which perished as predicted by the prophet” (1931, p. 11). In his monumental work on the city of Tyre, Katzenstein mentioned several ancient sources that discussed the position of “Old Tyre.” He wrote: “Later this town was dismantled by Alexander the Great in his famous siege of Tyre and disappeared totally with the change of the coastline brought about by the dike and the alluvial deposits that changed Tyre into a peninsula” (1973, p. 15, emp. added). It very likely is the case that the specific site of ancient Tyre has been buried by sand and water over the course of the last 2,500 years and is lost to modern knowledge. That the prophet was speaking about the mainland city in reference to many aspects of his prophecy has much to commend it. It was to that mainland city that King Nebuchadnezzar directed most of his attention and destructive measures described in Ezekiel 26:8-11. Furthermore, it was the mainland city that Alexander destroyed completely and cast into the sea to build his causeway to the island city. In addition, Benjamin Tudela’s quote corresponds precisely to the statement that the prophet made in the latter part of chapter 26: “For thus says the Lord God: ‘When I make you a desolate city, like the cities that are not inhabited, when I bring the deep upon you, and great waters cover you’” (26:19, emp. added). In addition, Katzenstein noted that the scholar H.L. Ginsberg has suggested that the name “Great Tyre” was given to the mainland city, while the island city was designated as “Little Tyre” (p. 20). He further noted 2 Samuel 24:7, which mentions “the stronghold of Tyre,” and commented that this “may refer to “Old Tyre,” or the mainland city (p. 20). Besides the idea that the bulk of the prophecy dealt with the mainland city, other possible solutions exist that would sufficiently meet the criteria that Tyre would “never be rebuilt” and would “be no more forever.” While it is true that a city does currently exist on the island, that city is not a “rebuilt” Tyre and has no real connection to the city condemned by Ezekiel other than its location. If the history of Tyre is traced more completely, it becomes evident that even the island city of Tyre suffered complete destruction. Fleming noted that in approximately A.D. 193. “Tyre was plundered and burned after a fearful slaughter of her citizens” (1966, p. 73). Around the year 1085, the Egyptians “succeeded in reducing Tyre, which for many years had been practically independent” (p. 85). Again, in about 1098, the Vizier of Egypt “entered the city and massacred a large number of people” (p. 88). In addition, the city was besieged in A.D. 1111 (p. 90), and again in April of 1124 (p. 95). Around the year 1155, the Egyptians entered Tyre, “made a raid with fire and sword...and carried off many prisoners and much plunder” (p. 101). In addition to the military campaigns against the city, at least two major earthquakes pummeled the city, one of which “ruined the wall surrounding the city” (p. 115). And ultimately, in A.D. 1291, the Sultan Halil massacred the inhabitants of Tyre and subjected the city to utter ruin. “Houses, factories, temples, everything in the city was consigned to the sword, flame and ruin” (p. 122). After this major defeat in 1291, Fleming cites several travel logs in which visitors to the city mention that citizens of the area in 1697 were “only a few poor wretches...subsisting chiefly upon fishing” (p. 124). In 1837, another earthquake pounded the remains of the city so that the streets were filled with debris from fallen houses to such a degree that they were impassable (p. 128). Taking these events into consideration, it is obvious that many nations continued to come against the island city, that it was destroyed on numerous occasions, and that it became a place for fishing, fulfilling Ezekiel’s prediction about the spreading of nets. Furthermore, it is evident that the multiple periods of destruction and rebuilding of the city have long since buried the Phoenician city that came under the condemnation of Ezekiel. The Columbia Encyclopedia, under its entry for Tyre, noted: “The principal ruins of the city today are those of buildings erected by the Crusaders. There are some Greco-Roman remains, but any left by the Phoenicians lie underneath the present town” (“Tyre,” 2006, emp. added). no evidence supports the thesis that Ezekiel’s predictions were penned later than 400 B.C. Moreover, the book (Ezek. 1:1; 8:1; 33:1; 40:1-4) claims to have been composed by the prophet sometime in the sixth century, B.C., and Josephus attributes the book to the Hebrew prophet during the time in question (1995, p. 98). In addition, Ezekiel was included in the Septuagint, which is the “earliest version of the Old Testament Scriptures” available—a translation from Hebrew to Greek which was “executed at Alexandria in the third century before the Christian era” (Septuagint, 1998,p. i). Simon Greenleaf, the lawyer who is renowned for having played a major role in the founding of Harvard Law School and for having written the Treatise on the Law of Evidence, scrutinized several biblical documents in light of the procedures practiced in a court of law. He noted one of the primary laws regarding ancient documents: “Every document, apparently ancient, coming from the proper repository or custody, and bearing on its face no evident marks of forgery, the law presumes to be genuine, and devolves the opposing party the burden of proving it to be otherwise” (1995, p. 16). He then noted that “this is precisely the case with the Sacred Writings. They have been used in the church from time immemorial, and thus are found in the place where alone they ought to be looked for” (pp. 16-17). Specifically in regard to Ezekiel, that is exactly the case. If the prophet wrote it in the sixth century B.C. his work is exactly where it should be, translated in the Septuagint around the year 250 B.C., and noted to be from the proper time period by Josephus in approximately A.D. 90. Furthermore, the scholarly world recognized the book’s authenticity and original date of composition virtually unanimously for almost 1,900 years. The eminently respected Hebrew scholars Keil and Delitzsch, who wrote in the late 1800s, commented: “The genuineness of Ezekiel’s prophecies is, at the present day, unanimously recognized by all critics. There is, moreover, no longer any doubt that the writing down and redaction of them in the volume which has been transmitted to us were the work of the prophet himself” (1982, 9:16). Indeed, Archer noted that no serious objection to the book’s integrity was even put forth until 1924 (1974, p. 369). Of course, this viewpoint is based on purely subjective considerations. No inherent reason exists that forbids a single writer from presenting both emphases. In fact, virtually all the prophets of the Old Testament announce judgment upon God’s people and/or their neighbors and then follow that judgment sentence with words of future hope and restoration if repentance is forthcoming.... One must be in possession of a prejudicial perspective before approaching Scripture to come to such a conclusion (1995, p. 138). The second objection to the integrity of Ezekiel has little more to commend it than the first. The second “proof” of the book’s alleged inauthentic nature revolves around the fact that in certain sections, Ezekiel seems to be an eyewitness to events that are happening in Palestine, while at the same time claiming to be writing from Babylon. This objection can be dealt with quickly in a twofold manner. First, it would be possible, and very likely, that news would travel from the remnant of Israelites still free in Palestine to the captives in Babylon. Second, and more likely, if Ezekiel was guided by divine inspiration, he could have been given the ability to know events in Palestine that he did not see (see Miller, 1995, pp. 138-139). Taking the prophecy of Tyre into account, it is clear that Ezekiel did possess/receive revelation that allowed him to report events that he had not seen and that were yet to take place. A third objection to Ezekiel’s authenticity actually turns out not to be an objection at all, but rather a verification of Ezekiel’s integrity. W.F. Albright, the eminent and respected archaeologist, noted that one of C.C. Torrey’s “principle arguments against the authenticity of the prophecy” (the book of Ezekiel—KB) was the fact that Ezekiel dates things by the “years of Jehoiachin’s captivity” (1948, p. 164). Supposedly, Jehoiachin would not have been referred to as “king” since he was captive in another land and no longer ruled in his own. Until about 1940, this argument seemed to possess some merit. But in that year, Babylonian tablets were brought to light that contained a cuneiform inscription giving the Babylonian description of Jehoiachin as king of Judah, even though he was in captivity (p. 165). Albright concluded by saying: “The unusual dates in Ezekiel, so far from being indications that the book is not authentic, prove its authenticity in a most striking way” (p. 165). Due to the fact that modern critics have failed to shoulder the burden of proof laid upon them to discredit Ezekiel’s integrity and authenticity, Smith rightly stated: “The critical studies of the Book of Ezekiel over the past fifty years or so have largely cancelled each other out. The situation now is much the same as it was prior to 1924 (the work of Hoelscher) when the unity and integrity of the book were generally accepted by the critics” (Smith, 1979, p. 33). Miller correctly concluded: “All theories and speculations which call into question the unity and integrity of the book of Ezekiel are unconvincing.... The most convincing view is the traditional one that sees Ezekiel as the long recognized sixth century Hebrew prophet and author of the Old Testament book which bears his name” (1995, p. 139). So accurate were the prophecies made by Ezekiel that skeptics were forced to suggest a later date for his writings. Yet, such a later date cannot be maintained, and the admission of Ezekiel’s accuracy stands as irrefutable evidence of the prophet’s divine inspiration. With the penetrating gaze that can only be maintained by the Divine, God looked hundreds of years into the future and instructed Ezekiel precisely what to write so that in the centuries following the predictions, the fulfillment of every detail of the prophet’s words could be denied by no honest student of history. “When the word of the prophet comes to pass, the prophet will be known as one whom the Lord has truly sent” (Jeremiah 28:9). Ezekiel’s accurate prophecy adds yet another piece of insurmountable evidence to the fact that “all Scripture is inspired of God” (2 Timothy 3:16). Albright, W.F. (1948), “The Old Testament and Archaeology,” Old Testament Commentary, ed. Herbert Alleman and Elmer Flack (Philadelphia, PA: Muhlenberg Press). “Ancient Phoenicia” (no date), [On-line], URL: http://gorp.away.com/gorp/location/africa/phonici5.htm. “Ancient Tyre (Sour)” (no date), [On-line], URL: http://ancientneareast.tripod.com/Tyre.html. Archer, Gleason L. Jr. (1974), A Survey of Old Testament Introduction (Chicago, IL: Moody), revised edition. Barfield, Kenny (1995), The Prophet Motive (Nashville, TN: Gospel Advocate). Benjamin of Tudela (no date), “Traveling in Jerusalem,” [On-line], URL: http://chass.colostate-pueblo.edu/history/seminar/benjamin.htm. Benjamin of Tudela (1907), The Itinerary of Benjamin of Tudela (New York, NY: The House of the Jewish Book), [On-line], URL: http://chass.colostate-pueblo.edu/history/seminar/benjamin/ benjamin1.htm. Davis, George T.B. (1931), Fulfilled Prophecies that Prove the Bible (Philadelphia, PA: Million Testaments Campaign). Fleming, Wallace B. (1966), The History of Tyre (New York, NY: AMS Press). Free, Joseph P. and Howard F. Vos (1992), Archaeology and Bible History (Grand Rapids, MI: Zondervan). Greenleaf, Simon (1995), The Testimony of the Evangelists (Grand Rapids, MI: Kregel Classics). Herodotus, (1972 reprint), The Histories, trans. Aubrey De Sélincourt (London: Penguin). Josephus, Flavius (1987), The Life and Works of Flavius Josephus: Against Apion, trans. William Whitson (Peabody, MA: Hendrickson). Katzenstein, Jacob (1973), The History of Tyre (Jerusalem: The Schocken Institute for Jewish Research). Keil, C.F. and F. Delitzsch (1982 reprint), Commentary on the Old Testament—Ezekiel and Daniel (Grand Rapids, MI: Eerdmans). Miller, Dave (1995), “Introduction to Ezekiel,” Major Lessons from the Major Prophets, ed. B.J. Clarke (Pulaski, TN: Sain Publications). Rufus, Quintus Curtius (2001), The History of Alexander, trans. John Yardley (New York, NY: Penguin). Septuagint (1998 reprint), (Peabody, MA: Hendrickson). Siculus, Diodorus (1963), Library of History, trans. C. Bradford Welles (Cambridge, MA: Harvard University Press). Smith, James (1979), Ezekiel (Joplin, MO: College Press). Till, Farrell (no date), “Prophecies: Imaginary and Unfulfilled,” [On-line], URL: http://www.infidels.org/library/modern/farrell_till/prophecy.html. “Tyre” (2006), Columbia Encyclopedia, [On-line], URL: http://yahooligans.yahoo.com/reference/encyclopedia/entry?id=48355.